Slow Ticket Sales for Mariah Carey and Lionel Richie’s ‘All the Hits’ Tour? 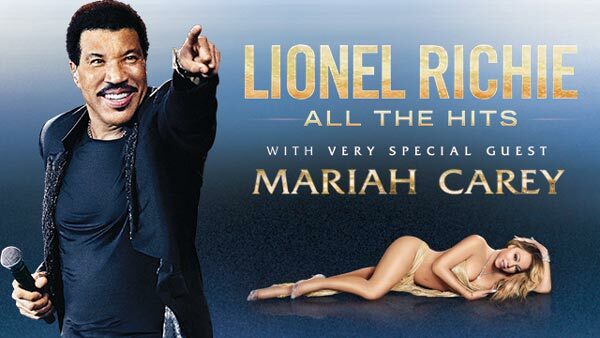 *Tickets for the upcoming “All the Hits” tour featuring Mariah Carey and Lionel Richie may not be selling as briskly as promoters would like. According to Page Six, Ticketmaster is trying to jump start sales by offering tickets as part of a “buy one, get one free” promotion for the concerts, which begin in March. “This Valentine’s Day, grab a ticket for you and your special someone … all for the price of one,” one promo suggests. Also, according to the Post, Carey’s new single “I Don’t,” a collaboration with rapper YG, “is a flop.” It entered the iTunes chart at No. 6, but was No. 55 as of press time. Industry insiders say Carey’s New Year’s Eve lip-sync fail may have something to do with the supposed decline in interest of her live shows. As previously reported, Mimi is scheduled to open for Richie in 35 cities.